In addition to watches like the Rolex Daytona and the Omega Speedmaster, the Navitimer from Breitling is without a doubt one of the greatest and most important chronographs of all time, given its rich history, rugged beauty, and synonymity with quality. While Breitling produces the Navitimer in wide range of different variants today, it’s worthwhile to look back at the origins of this pilot’s chronograph, to see where the brand’s designers are currently looking to for inspiration. The Navitimer’s story begins in 1952, when Breitling manufactured a stainless steel chronograph, with a black dial that featured the emblem of the “Aircraft Owners and Pilots Association”, or as it’s more commonly known, the AOPA. Especially desirable early examples were powered by either the Venus 178 or the Valjoux 72 – both workhouse, manually wound chronograph movements. These watches were effectively born out of a partnership between Breitling and the AOPA, since Breitling saw the sizeable interest for a professional pilot’s chronograph equipped with a number of useful scales surrounded by a slide rule bezel, and many members of the AOPA were among those interested. 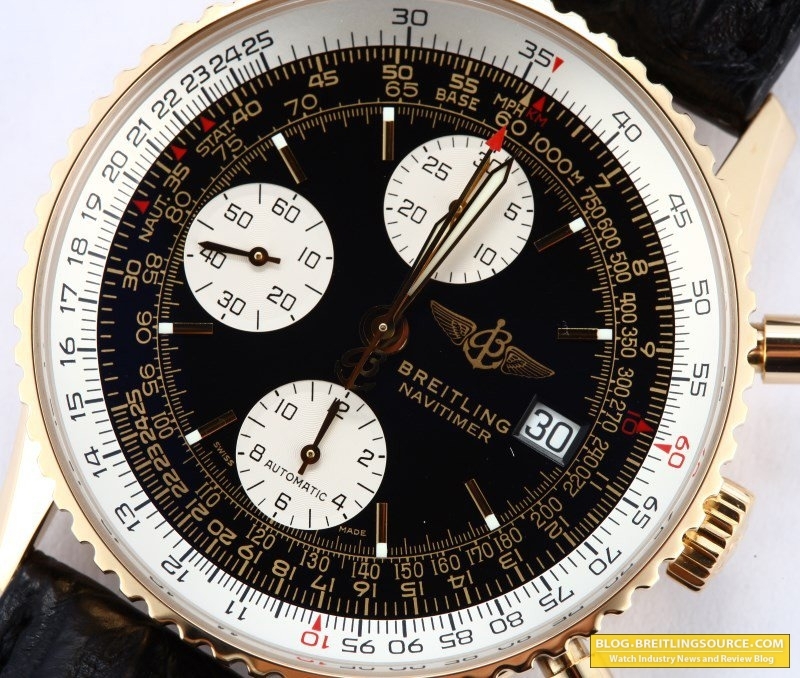 From then on, Breitling would continue to produce both functional and beautiful Navitimer pilot’s chronographs, that would be worn by tasteful collectors, and celebrated by professional pilots. 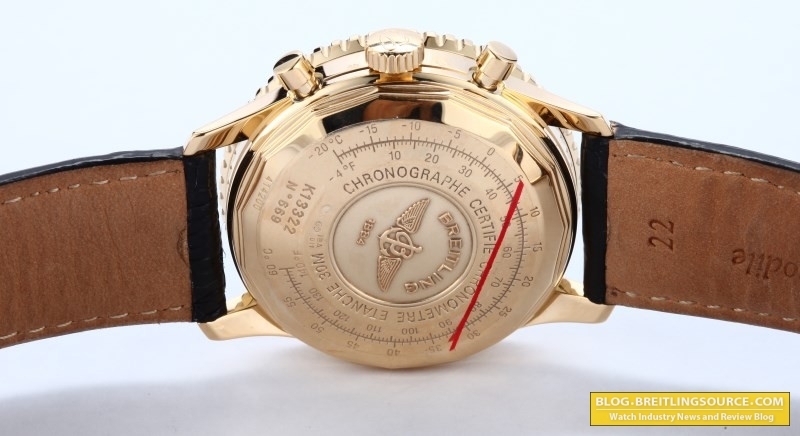 Today, rare vintage Navitimer references will often sell for astonishing prices at auction. Now knowing that the Navitimer is watch with a storied past, it’s nice to know to that as the brand has progressed through the years and evolved, they’ve still managed to channel the core DNA of what made some of their early watches so great. A watch that supports this notion perfectly is this one – the Ref. K13322 in brilliant 18K yellow gold. 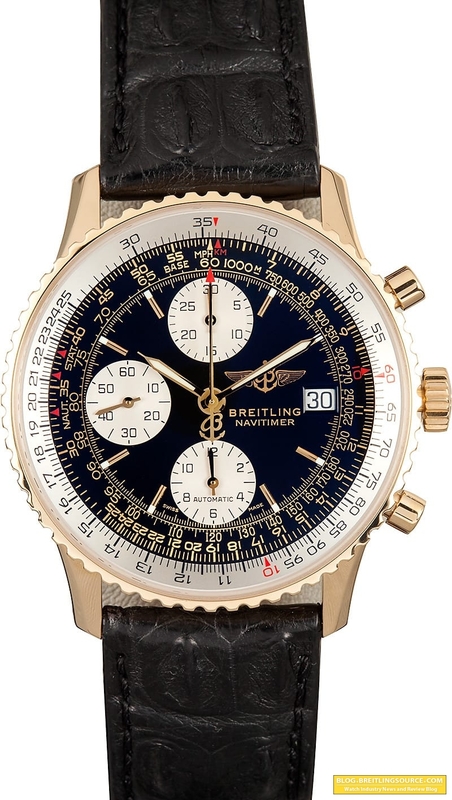 Even though this watch has a vertical stack of chronograph registers unlike what’s seen on classic 1950’s and 1960’s pieces, it maintains key details of the original watch, like the scientifically styled, highly legible numeral and scale font, along with the contrasting red accents, and iconic Breitling logo. 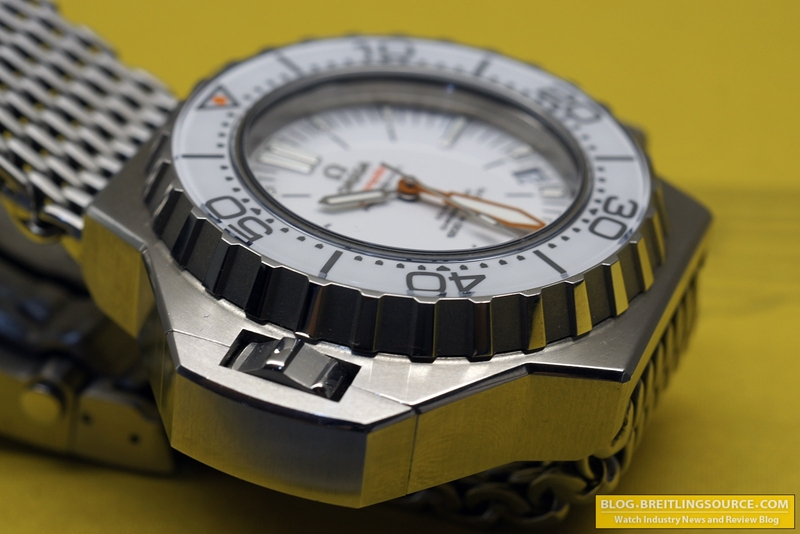 Breitling has also incorporated a number of modern conveniences into the watch’s movement, to give it a reliable and luxuriously hassle-free ownership experiences. 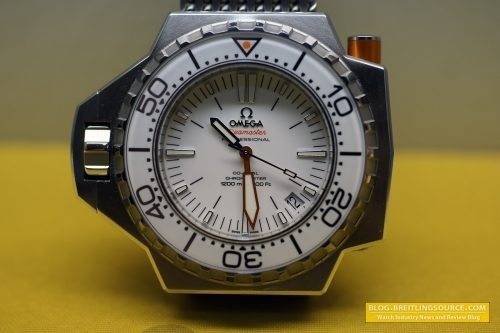 These conveniences include a Swiss made automatic movement with a power reserve of up to 42 hours, and a date complication located just between the brand logo and model designation on the glossy dial at 3 o’clock. Pair all of that with a hand crafted crocodile strap, with a Breitling signed buckle in matching 18K yellow gold, and you’ve got an awfully good looking timepiece, backed by years of history and watchmaking tradition. While collector’s tastes are beginning to diversify more and more in 2016’s watch market, you can never go wrong with a true legend of modern watchmaking, like the Navitimer. Such watches are sure to provide years of versatile wear and perpetual delight for generations to come. You really just can’t beat the classics, can you? 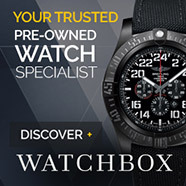 Author of this Article: Paul Altieri is the Founder and CEO of the popular pre-owned watch site Bob’s Watches. There she is, the white-dialed beauty in all her vintage re-issued glory. I love re-issues of vintage pieces, mostly because I love vintage styled watches but I don’t like the maintenance and hassle of vintage pieces. A lot of people would call that character, and I agree, however life is already complicated enough for me! The name Ploprof is very odd, but has a simple meaning – it is short for Plongeur Professionnel, which means Professional Diver in French. Here she is from another angle. The bezel features a sapphire crystal insert that lines up perfectly with the sapphire crystal over the watch dial which is pretty cool. Its a flat surface all the way across. I love the way the bezel looks sunken underneath the sapphire crystal. The lume is very solid on this model, and because its the white dialed model, the whole bezel is actually lume! It glows like a torch in the dark which is pretty awesome. 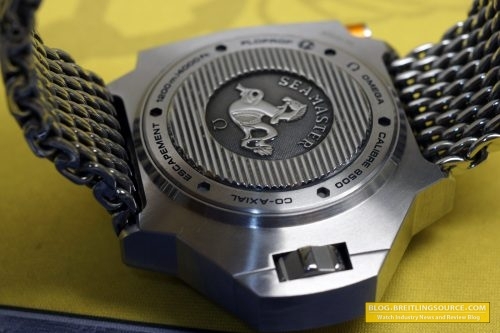 The back has the familiar Seamaster Seahorse, or “Hippocampus”, emblem on it surrounded by some ridges presumably to make the watch sit better on the wrist. 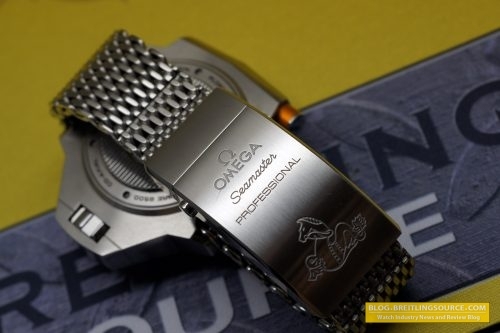 It also provides some important information about the watch, should you forget, such as the 8500 Caliber Movement, 1200m Water Resistance, and Co-Axial Escapement. The 8500 Caliber is Omega’s ubiquitous in-house co-axial escapement movement that is featured in several of their watches. It is a solid and reliable movement. The crown is an interesting design, and may appear difficult to access when you first look at it. However, it is quite the opposite and is engaged by simply unscrewing the crown as usual. The outer guard simply comes out as the crown is unscrewed. Its very solid looking, as well as feeling, and is a nice update to the original. This robust case design measures in at an imposing 55 x 48mm, but is surprising wearable. One of the most prominent features of the Proprof is the metal orange button that is located on the right side of the watch around the 2 o’clock mark. 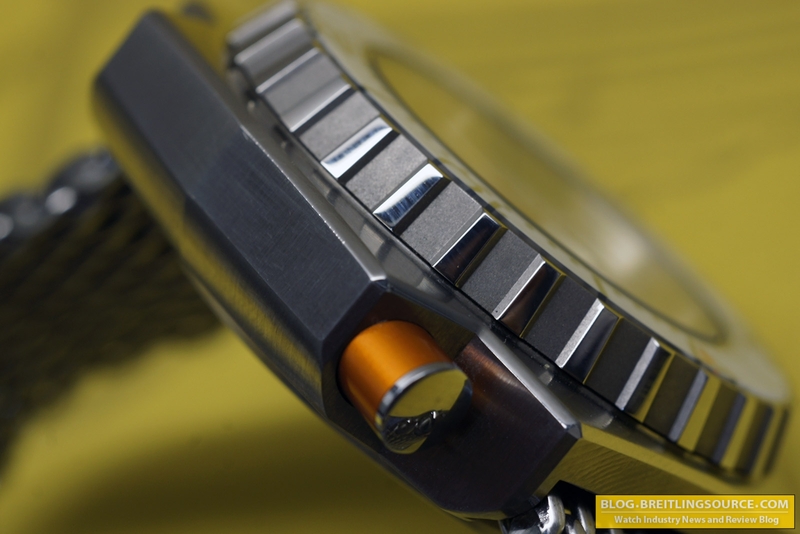 The purpose of this overbuilt button is to unlock the bezel so that it can be turned. 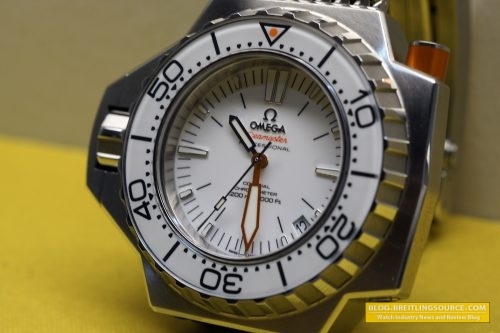 Normally, diver watches just have a unidirectional ratcheting system so that you can’t accidentally move the bezel in the opposite direction. 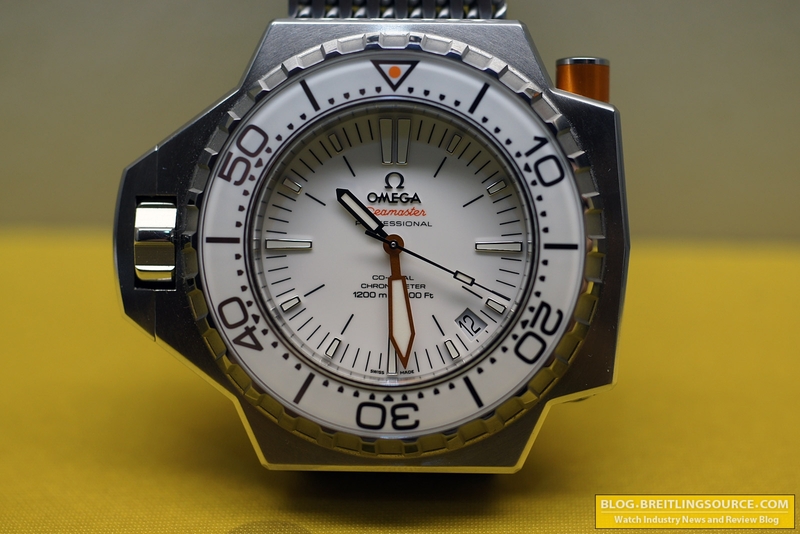 The Ploprof takes this one further by completely locking the bezel unless that button is depressed. This makes it almost impossible to accidentally turn the bezel under any condition, and in any direction. The Shark Mesh bracelet looks awesome, and is probably one of the nicest mesh bracelets on the market. It is very comfortable and heavy, with a nice smooth finish to it and an incredibly robust buckle with diver extension. The Omega Seamaster Seahorse is engraved into the machined stainless steel buckle as well. 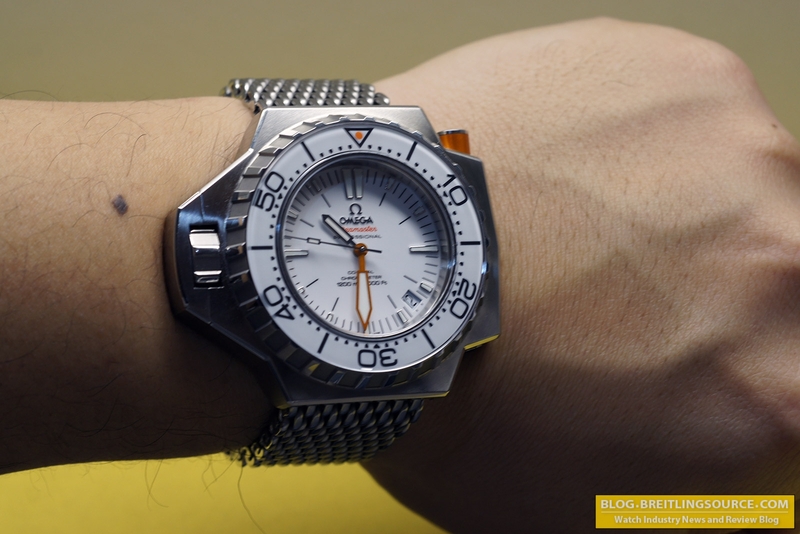 There is the wrist shot, showing this fantastic watch on my 6.75″ wrist. I think it looks great, and wears very similarly to a 44mm Panerai. The watch is tough to wear with suits, but it works really good for casual wear. 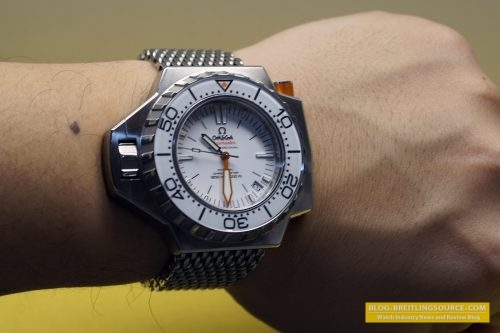 Not a lot of bad things to say about this watch, besides the fact that it does have a unique look that may not appeal to everyone. Hope you guys enjoyed the review.